The Highlights: Blue Ridge Mountain scenery; Historic towns and trails; Railroad history and museum; historic Hotel Roanoke; Dozens of scenic places to hike, paddle and pedal. Other Places Nearby: Blue Ridge Parkway; Historic Fincastle, VA; the Roanoke and Upper James Rivers; the Home Place Restaurant in Catawba. Meetings Options: The Hotel Roanoke has 63,000 square feet of meeting space and can handle groups from 20 to 1,200. Downtown’s Center in the Square offers a multitude of special event spaces for groups of up to 500. Numerous other small venues are available for weddings, corporate retreats and incentive groups. Nestled against the eastern foothills of the Blue Ridge Mountains about two hours from Charlottesville and three hours from Richmond, Roanoke has been called the commercial and cultural hub of southwest Virginia, thanks largely to its history as a thriving railroad junction and builder of 19th Century steam locomotives, and later as a textile manufacturing center. Today its main claim to fame is as a healthcare and technology magnet, as well as being the gateway to myriad recreational opportunities centered around the nearby mountains and the Roanoke River, not to mention the Roosevelt-era Blue Ridge Parkway that follows the ridgetop of the Blue Ridge mountains for nearly 470 miles connecting the Shenandoah National Park in Virginia with the Great Smokies National Park in North Carolina. 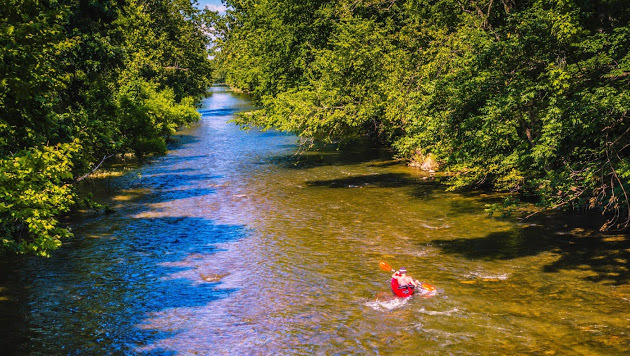 Think hiking, paddling and pedaling (the Roanoke Valley was named one of the ten most bike-friendly areas in the U.S. by USA Today Travel), and scenic drives, as well as less physical activities like antiquing, visiting museums and sampling the area’s rich culinary possibilities.